XYBEX®Custom Systems, a spin-off of the 1000 system, is a complete, full capacity single product coolant recycling system. The system usually shares the same operation and layout as the 1000. However, tank capacities and the centrifuge are altered to meet customer's needs. 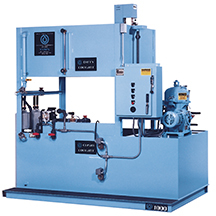 For plants operating with one coolant, the Custom Systems capacities can be enlarged to meet sump capacities of the larger metalworking plants.